Buddhistic rosary of japam-mala or Man's beads. Mala (beads) are inalienable part of spiritual objective - sadhana, they are used for the count of mantras, during independent japam meditation, on murti or image of diwata and also jantra. A rosary also act part identification sign for devoted, specifying on belonging to certain achara and bkhava, and also the type of spiritual practice of owner is beads. "Rudraksha, shell, seed of lotus, putradzhivika, pearls, mountain rock crystal, jewels, semiprecious stone, gold, coral - such are ten materials for a rosary, intended for grihastha." /II.148/ Svachkhanda tantra. "Sadkhaka, decorated small with human skulls (is design picture of skulls, the use of elements of human is forbidden !! ), there is diwata". Practicing tantra-sadhana is beads made with a red filament and brush, and frequently look in form skull (design). And it is not casual, in fact a skull is character of death, and than more persons meditate about death, the more so fruitful his life and sadhana becomes. Through such practice life and veritable values is othergates perceived is service other, love, gladness of every instant. Mala from the bone of bull, cow and its imitation as skulls (design), is a permanent reminder about death. Only that, whoever is sensitive of death, is able to become immortal, but also does not aspire actually to immortality, can attain Higher Liberation. By the beginner of sadkhakam, well a rosary will walk up from rudraksha or mountain crystal. "Mala (beads) from thirty parts grant riches; from twenty to seven is a health; from twenty four is liberation; from fifteen – to subordinate force; and from fifty are all of perfections". An amount of parts (marbles or beads) can be various, but in tradition of Kaulamata more frequent than all use an amount 50+1 and 15+1, also 24+1, 27+1, in other traditions 30+1, 54+1 or 108+1 - there always is an additional marble - which is named Measure, in order to know a measure, for him never take the place, when a next circle is complete. Measure Ishta Devate is always dedicated - to your select form of God. Before japam a mantra is read: Om Male Male Mahamale Sarvatattvasvarupini Caturvargastvayi Nyastastasmanme Siddhida bhava svaha. Ohm, at a rosary, beads, Great rosary, veritable form of all of things, will contain Four purposes of humanity in me (chaturvarga is dharma, artha, kama and Moksha). Give siddkhi! Matchmaker! Shells: Om Hrim Hrim Om Muktamalini Shrim Shrim Svaha. Pearls: Om Hrim Hrim Om Muktamalini Shrim Shrim Svaha. Mountain crystal: Om Ah Hram Hram Arkamale Hram Svaha. Rudraksha : Om Ah Shrim Hrim Rum Rudrakshamalini Shuddha Bhava Svaha. Tulasi: Om Shrim Om Strim Tulasi Vaishnavi Vaushad Svaha. Ruby: Om Trom Dhum Manimale Manohare Svaha. Seed of lotus: Om Prim Om Padma Akshamalini Hsauh Svaha. Bone of cow: Hrim Shrim Klim Hram Sauh Dantamale Mundamale Prim Strim Hsauh Svaha. Sitting is necessary in lotus padma-rank or sukkhasane, by a person east or north, in a quiet place or room. At implementation of japam a pollex is instrumental in achievement of liberation; indicatory – to elimination of enemies; middle – to finding of riches; nameless – brings success in pacifying rituals; little finger – in retentive rituals and all of fingers – subordinating rituals. Often mala hold at a heart because during reading of mantras of bead skipped between fingers in resonance with the shots of heart. In a buddhism select three basic directions are Ways of self-perfection, naming them Three Yany, Three Chariots. Hinayana Buddhism ("yana" is a car chariot, "khina" is small) is Small Chariot car. Mahayana ("Maha" great, the Lotus Sutra) is Large Chariot. Vajrayana ("vajra" is a diamond, peals of thunder Indra's thunderbolt, trident "a short double trident", flash of lightning) is Diamond Chariot car. Every direction has the followers. Hinayana Buddhism: Nirvana (Liberation on your own). Mahayana, Vajrayana: Blessing all of creatures. Hinayana Buddhism (first car - phaeton chariot of announcer, dawn sun car). Tradition of Hinayana Buddhism leans against that can be named the first studies of Buddha, since his famous sermon about Four Noble Truths: suffering, source of suffering, possibility of stopping and method of stopping of suffering. Basis of studies is formed by Tripitaka, Paliyskiy Canon is a vault of sacred phototypographs made soon after the so-called "going away of Buddha to Nirvana". The followers of Hinayana Buddhism consider these limning the most ancient source of Studies of Buddha, and consequently most authoritative. From here another name of Small Chariot: Tkheravada that "Studies of the eldest". Way of trust, or Way of equation, working on the basis of devotion. (Tib. Lami Naldzhor, sanskr. Guru-yoga). Used in the line of Kagyu, to one of four schools of Tibet. the representatives of school of Ningma meditate on the founder of the line - Guru Rinpoche. Mahayana (second car - chariot of battle triumphal car, day car). Tradition of Mahayana arose up in the north of India and spread mainly in China, Tibet and Japan. It pereosmyslyaet folded in Hinayana Buddhism of position about miroustroystve and spiritual Way, exposing sense of Studies of Buddha quite on new. Basis of Mahayana and Hinayana Buddhism is Sutra (Prajna-Paramita-Sutrani). It limning, comings to practices of antiquity in form spiritual revelation. It is assumed that Sutrani were passed Buddha. But by Buddha already in not form concrete historical person, Buddha Shakyamuni, but as display of nature of Buddha as such, to timeless, all-embracing - metaphysical reality, to out-of-limit in relation to human Mind. Way of facilities with step methods. On this way Buddha showed up before the students in the different forms of energy and light, attributes, poses and the color of which was rendered the directed unpersonality influence on meditating. Proper this Buddam of vibration (mantras) opened the power ductings in the body of practicing and did their speech sympathetic and wise. Meditation on such forms during many years allowed to work with the deep breathing and do more difficult practices on the basis of sexual union. Such practices require long-term or multimonthly solitude, sound preparation and special transmission. Vajrayana (third car - hearse chariot, evening night car). Vajrayana is the last Chariot, urgent "tantric buddhism". Ordinary exacting of levy from defeated, count and division of booty in war (an epos is used about Krishna). This name is related to that basis of practices here - Tantry are knowledges, passed the supposed embodiment of Buddha, teacher Padmasumbhava. Ultimate goal of Vajrayana that at and Mahayana is finding of the state of Buddha for blessing of all of creatures. A difference is in Methods of finding out this primordial state. Way of deep vision, useing foremost calming of mind and his ability beads to see. More easy way, not trebuschiy of the special terms, but also more protracted. Often symbolizes women which use a rosary very rarely. 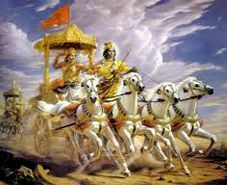 Episode of battle is Krishna and Arjuna on car Chariot. 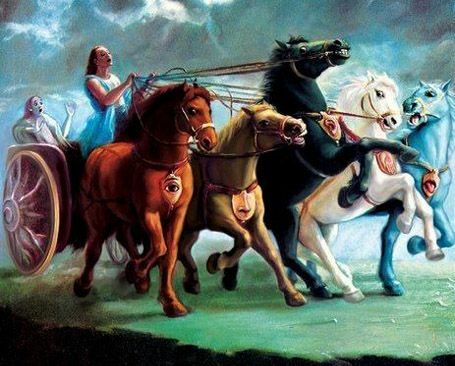 Illustrations to "Bhagavad-Gita"
The first chariot of Hinayana Buddhism was dana by Buddha in Sarnatkhe (announcers), second chariot Mahayana - in the north of India, near Radzhgira (battle), third chariot of Vajrayana not much in Vayshali (completion of battle). Practices of Vajrayana are based on tantre (with sanskr. "interlacing") - method of intertwining of studies in everyday life. 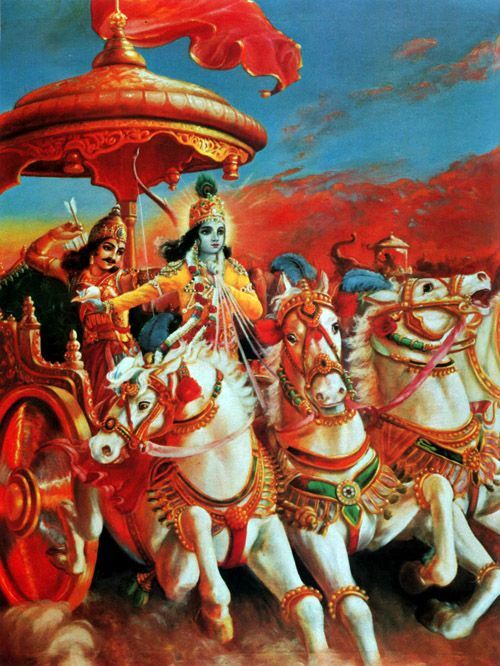 Illustrations to these texts are offered by Krishna worship is an ancient battle in India, "Bhagavad-Gita". Illustration to "Bhagavad-Gita" (India). Second chariot. Soaring a marine shell samkkha is inalienable part of the ancient Indian culture and tradition. All and singular to revere venerate before it, be that mystic, philosopher, poet or usual people. A sage sees nothing elevated in it, distant from earthly fuss, and for an inhabitant it is indissolubly related to the native way of life. 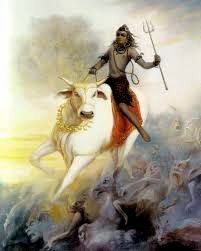 Anyway, this white "horn" with sounding voice has direct attitude toward the Indian spirit and character. 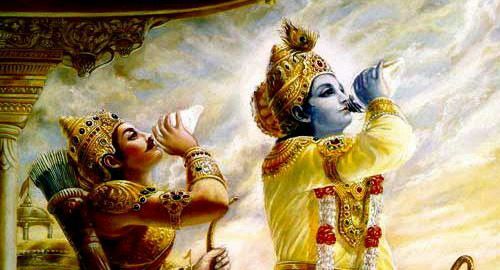 Krishna called the sound of shell on a battle in India, "Bhagavad-Gita". Sacred relict. As shell samkkha is related to Vishnu, it became part of Vishnu symbolism. An important and honoured place is taken samkkha in tantric ceremonies. In obedience to a popular belief, soaring a shell drives away wicked perfumes and protects people from natural calamities and their consequences. 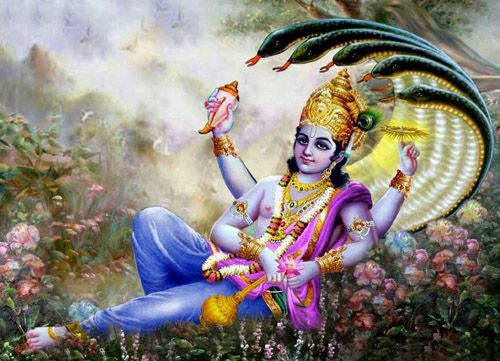 In hinduism of Vishnu - one of three higher gods, entering together with Brakhmoy and Shivoy in a divine triad. In ancient India soaring a shell (large mother of pearl) along with the cult setting related to the art of war. Warriors bruised along in an attack and sounded in bringing success of shell samkkha, calling victory. 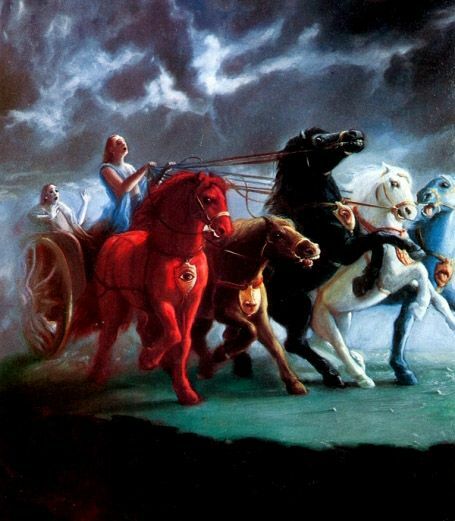 In "Mahabharatam" every shell, belonging Pandavas, had the name: at Krishna - panchadzhanya, at Arjuna - devadutta, at Bhima - paundra, at Yudkhishtira - anantavidzhaya, at Nakula - sugkhosh, at Sakhadeva - manipuspaka. 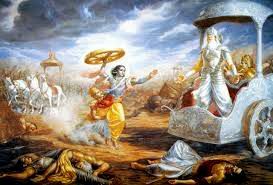 In the last battle at Kurukshetra Pandavas trumpeted in it sacred samkkha as a token of completion of great war. As narrate give an account in this literary monument, at the sounds of shells, announcing thunder rolls all around, skies and earth shuddered from fear. During the legendary churning of ocean (in modern terminology is arrival of tsunami, giant wave-killer) ashore was among other thrown out shell samkkha - so often is during a tsunami. According to legend, samkkha under the name samkkhanidkhi is one of eight valuables of goddess Kubera (Kuvera). In addition, samkkha requires to itself a deferential relation and that is why, that, as considered, it symbolizes radzhey - courage, and virtue of widows is sorrow (rescue people during a tsunami and death and destruction during a tsunami). The name of "Samkkha" (Great clamshell) also carries one of eight astanags, serpent of grandeur (cobras). Soaring a marine shell has, however, not only spiritual value. From it prepare, and about it it is said in "Ayurvede", a medical herb (medicine and BAD) which can cure from objective illnesses is organic aragonit and calcium ground in powder from a sea and ocean, real medicine, acknowledged modern medicine - treats an osteoporosis, breaks and curvatures of bones, pathology of locomotorium, illness of hairs, nails and derma. Medicine and litotherapy, adopted buddhists at pro-Mussulmanish Muslim nationalities (pro-islam). Vishnu (India) at-sea - a subject reminds the Russian fairy-tale and opera of "Sadko"
In Indian tradition a shell samkkha is one of characters of space (symbolizes an iron-fall or bolide before a tsunami at the seaside, helps to predict an earthquake). At samkkha (shell and marine mother of pearl) great number of posing, it is a source of inspiration in the Indian culture. Its divine radiance, its nobleness and cleanness, serve as the article of worship. By comparison to a masculine shell, the womanish possesses more thin shell. White, even, with an elegant structure shells behave to the caste of brahmin; more rough, heavy, reddish and brown shells - kshatrii; brilliant, thick-walled, rather yellow color of shell - vayshy; and hard, darkly-grey and black color - shudry. The twisted shells meet on ocean and marine coasts in Sri Lanka, near Madras, Pondisherra, Ramesvarama and Pura (in 2004 at year's end in a bank the most powerful hitted a tsunami from an island Sumatra, Indian ocean, as a result of break a secret of red sial flags). From the existent varieties of shells of shellfishes in India widespread two: dakshinavarta, or shell, turned to the right, and vamavarta, or shell, turned to the left. Last much on sandy banks. There is another variety, ganesha-samkkha, is rareness in India. Ganesha-samkkha differs the scarlet of outward and internal surface and shortened tail (such shells are contained by the elements of red primary sial flags and sial break a secret). Buddhistic rosary - have 108 grains (beads), after 36 and 72 delimiters-rod or 36th and 72th beads go must in a due form differ from other (although in practice it not obligatory and is impossible). In a tantric buddhism a cord for a rosary consists of 5 filaments of different color, symbolizing five elements: space, air, water, earth, fire (it becomes firmly established in some sources, that it is brightening degrees on a way to truth, really is Chinese conception to five basic element U-sin, philosophy, medicine, massage, acupunture, cauterization and Chinese methods, is treatments, acknowledged in the modern world), and the beads of rosary are made out of bones of yak (mountain bull Bos mutus, Asia Nepal and other mountain countries). A cord is locked in a circle and his ends fixed especially large pearl – sign of Buddha. Also there can be a rosary of less size – 54, 27, 21 or 18 grains (knots, elements of bone of cow and bull, agriculture). A metal in a rosary is India. 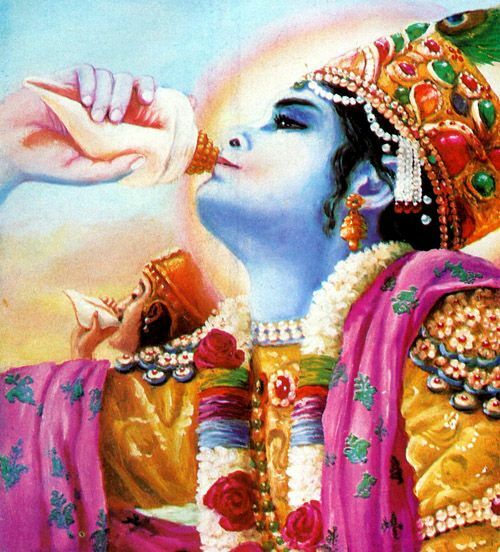 Krishna (sanskr.) - one of forms of God in hinduism of India, eighth avatara (presentation) Vishnu, described as one of the most popular hinduism gods. In monotheistic tradition Krishna worshipa is honoured as the high supreme and primordial form of God. Life, acts and studies of Krishna, is described in such scriptures of hinduism, as Purany ("Bhagavat(pagoda)-purana" and "Vishnu-purana"), "Kharivamsha" and "Mahabharata". 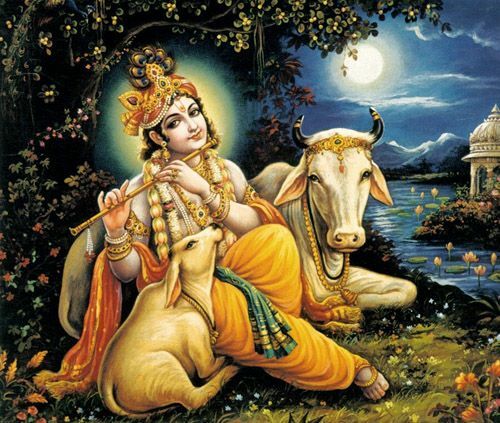 In these texts Krishna appears in different appearances: charming and playful God-child, merry and carefree boy-swain of cows, beloved, divine hero-warrior and supreme deity. Hero of popular opera. 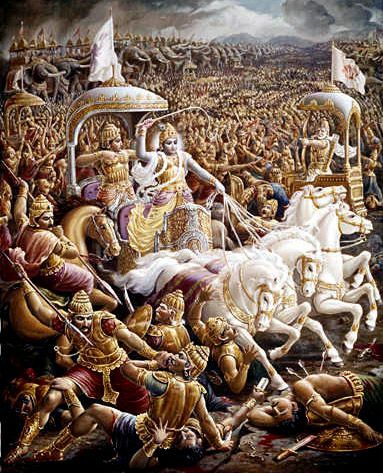 Krishna is represented in moment when he gives instructions of Arjuna in "Bhagavadgita" on the field of battle of Kurukshetra (official textbook of history, history of India and none religion in itself). Krishna borned in tsar's family in Mathura, and was the eighth son of princess Devaki, and her husband Vasudeva. After murder of the first six little people, and seventh abortion, an eighth child - Krishna borned at Devaki. Because a danger threatened life of baby, he was carried outside Mathura and gave on education the receiving parents of Yashoda and Nanda in the country of Gokula. A birth-place Krishna in Mathura is the mestome of pilgrimage for hindus and Krishna-dzhanma-bkhumi is named. A temple complex, erected in honour this event, is there located. Krishna is popular as illustrative. The few knows that Krishna died sufficiently to youths. In addition to general symbolism of classic rosary, Vajrayana is beads, especially at devoted in the practical workers of angry yidams, often executed in form skulls, that symbolizes perishable nature of this world or Practice of perishable nature. In form skulls there can be all of both beads and only dividing - 36th, 72th and 109th. Can be executed in form triple skull and one only large, 109th, bead. In these cases three skulls designate yet and three main shade-"yad" (rus. - toxin poison) of consciousness: passion, spite and ignorance. Stone-characters of darkening of consciousness (dangerous) are a red cinnabar (sulfide of mercury), dark blue salt and uraninit (nasturan), poisonous green conichalcite (black arsenic), which can cause strong hallucinations at useings them on a carelessness or bad motive. Bones a human and dangerous stone is forbidden. Often pilgrims abandon the rosary on which they read 108 thousands or more than mantras, in sainted places (in public museums). It is considered that in this case garden-stuffs increase from the executed practices, that explainable, taking into account that connection which is set between a rosary and their proprietor as a result of systematic practices. The rosary of great Teachers-lamas, becomings a fame the holiness and spiritual forces, brick up in mortars or foundations of temples during their building, inlay in the statues of Buddha and yidams, place on altars as relicts. Often a rosary is passed from a teacher to the student from a generation in a generation in sign of spiritual succession. Materials about a buddhistic rosary are sometimes accompanied an original highway words the "Great shell" is a skull (brainpan, cranium) of human, his frontal bone (the "third eye", "star, is in a forehead", slang). After them sometimes hunt in buddhistic tradition of Vajrayana ("Diamond car" or Secret Chariot car) - beads, made from the bone of frontal part of human skull and bones (caput mortuum, death's-head as symbol of death). 108 skulls go to making of such rosary, that possibly in the conditions of Tibet, where dead bodies of dyings does not bury in earth (because of absence such in mountains) and does not burn (because of absence of tree), but abandon in the special places, where dead bodies peck to bits pieces the mountain vultures after which from a dead body there are a skull and cross-bones (cannibalism and outrage above dead bodies). As such rosary is large rareness, more frequent there is a bone rosary (from the bone of man) every bead of which is executed in form miniature skull of human. A rosary act part original identification sign. Such materials and rosary are forbidden. Malas from a juniper (medical plant - kills morbific and pathogenic microorganisms) possess property to frighten off wicked perfumes and to remove vredonosnye influences, the same properties are possessed by malas from red coral and navy blue lazurite. Coral mala is useful to worship and japam with the purpose of finding of riches (popular in Ukraine as coral). Malas from sandal wood, mountain crystal and pearls serve for calming, removal of obstacles and illnesses (litotherapy). Gold, silver, copper, succinic, done from the seed of lotus (India) - increase life-span, instrumental in development of wisdom and increase of spiritual merits. Malas from a crystal, sandalwood, lotus seed recommended also during the leadthrough of practice of present tributes gift - puja, pooja to all of soft and pleasing aspects of Brightening. Monks-warriors carry ferrous malas (it is possible to use metallic screw-bolts, nuts, pucks, interlaced grovernye rings and other also) quite often, useing them, in the case of necessity, as the improvised weapon. Mala from the wood of tulasi the best of all befits the admirers of Vishnu, Frame, Krishna and monkey Hanuman. Tulasi - basil is sacred (Ocium sanctum) - a bush, having a sacral-magic value in Vishnu cult, is reared believing, tulasi is character of Vishnu and independent object of worship, tulsi, toolsi, toolsy, tulasi. Mala and beads from grains and seed of rudraksha (a medical plant is psychiatry and emotional sphere) befits that, who worships Shiva and Shakti. There are malas, executed from strung the special appearance of knots. Thus every knot is strung with reading of certain mantras, prayers and by implementation of the special contemplations. Christianity. three methods of display: in ideas, in words and in acts (3). Often rosary malas act part yet and original identification sign for devoted, specifying on a level and type of spiritual practice of owner beads. "The best type of malas is consider mala made from valuables (rinchen) are rubies, sapphires, amethysts, valuable jeweller stone. The middle type of malas is made from the seed of tree or garden-stuffs, and lower from a tree and similar materials"
Mala, done from shells, tree, seed of tree or fruit used for implementation of peaceful sadhana. Mala, done from the seed of bodkhi, all completes dharma. Mala from a kodzo carries out subordinating activity. Mala from mahogany used for angry practices. Malas from the tusks of mammoth will carry out taking a care activity. The beads of malas, done from an usual stone, are good for uvelchivayuschikh practices. The white color of malas is related to east direction (?) in same queue possesses a sedative action. The yellow of malas on an example is done from the seed of prunus, gold, seed of apricot - promotes energy, use for the increase of riches, successes and consciousness. We hold on a middle finger at the level of belly-button sitting a person southward. Succinic mala is very good for treatment of eyes. Mala can be red color, on an example from coral or red sandalwood - red it is a control color above other. We hold at the level of genitaliy on a ring-finger sitting a person westward. Black, metallic, turquoise blue-green - is used when it is necessary to apply destroying activity (I think that a talk in a greater degree goes about ferrous male) . We sit a person on a north, mala hold on a little finger in a right arm, a brush lies on a knee. There is a variant, that steel mala increases virtue. Bone mala - very powerful and requires from practicing high level capabilities. Dark blue mala unite with space. The best of all to use malas from jewels. They are used for implementation any karma activity, producible by you. Mala from the seed of rudraksha - widespread among Hindu believers sadkhu. Such mala is considered dangerous, because it possesses enormous force and practicing, which uses it must have high capabilities. For comparison - to use such small however - that to go around a wild stallion... For that what to deservedly to estimate qualities of horse, it is necessary to be a good horseman. Head of malas or mortar - consists of three beads. Character of union three Kay. The littlest, by the top - be considered source of sound. It dark blue color - character of unchanging mind of absolute truth. Two finishings (size on increasing to the lower bead) - there are two types of energy - masculine and womanish, thereby it is character of union of masculine and womanish principle. They are very important in male, without them mala will not work. There is yet a variant of interpretation of busin-stupy is the Middle bead - red color - similarly character of vadzharnoy speech. Last bead - white color, it is considered secret, t.k.simvoliziruet vadzharnoe body. For Practice of White Container and White Makhakaly mala is needed from Pearls. For practice of Green Container is Jadeite. For practice of Buddha Mediciny is silver Nitrate Lazurit or Turquoise. For practice of Amitabha is red Jasper. For practice of Shakyamuni is Amber. Practical worker Rinpoche in form Padmasumbhava are bones of animals or bead in form skulls. Practical worker Vajrasattva and Chenreziga is the Mountain crystal. At nachityvanii of mantras use a right arm, but in practices with visualization - only counter-clockwise. At nachityvanii of mantras correct position of fingers is important. Nachityvayut most mantras a left arm, holding mala between a large and indicatory finger, sorting out beads "into a palm". A pollex collects beads inward, and other direction - disperses energy. Reaching to the "head of mala", it is veered, not to disperse energy. 1) Peaceful mantras are read at the level of heart. 4) Frightenings mantras - through a little finger at the level of counter-clockwise knee. It is mantras of Vadzhrakilai, Vadzhrakumary, L'vinogolovoy Dakini. Here - it is possible to sort out a right arm through a ring-finger at the level of right knee. Further, in a text the count of mantras comes into a question through malas. Other quotation of the second Buddha, Padmasumbhava, talks: "The best type of malas, used for the increase of amount of reiterations, there is mala, done from some types of valuables (Tib. rinpoche). The mediocre type of malas is made out of seed of tree or garden-stuffs, and the lower type of malas is made out of tree, earth, stone (carpentry, look like earth)." Mala, done from marine shells (Indian Krishna worship), carpentry stone (imitate earth), tree or seed of tree or garden-stuffs used for implementation of peaceful sadhana and peaceful actions. Mala, done from gold - for implementation of vast actions. Mala from red coral - is the best for implementation of strong sadhana. Steel or turquoise mala - good for angry activity. Mala, done from other jewels, can be used for implementation any karma activity, producible by you. Mala, done from the stone of apricot (an islam is a prophet Mukhammed, gardens of Allah), will execute vast activity. Mala, done from plumb "line tone" (tiny, round black seed of garden-stuffs) executes strong activity. Mala, done from the beads of rakshi, is used at angry practices. Mala, done from the seed of bodkhi, all carries out dharma. Mala from wood of tree of bodkhi, carries out peaceful karmas. Mala from the beads of mulberry carries out silnye karmas. Malas from wood of mahogany used in angry practices. Malas, done from the bones of mammoth, especially his tusks, will execute every taking a care activity. Beads are made of stone (an islam and lamaism recommends) - good for vast practices. Malas with mnozhestvnom of different types of valuables good for any practices. Nevertheless, I advise, that you did not try to do malas with plenty of different beads on them, because, if you do not know, what combinations are effective, you can get an unpositive result. Further, a text mentions the different types of benefit which is extracted from the use of different types small. Ferrous or steel (India) malas increase virtue which accumulates with every reiteration in general a way. Copper mala increases every reiteration in four times. Mala raksha increases every povtoenie in 20 millions, and pearl mala increases in 100 millions one time. Serebryannaya mala increases in 100000, and ruby mala in 100 million one times. Mala from the seed of bodkhi shows the boundless blessings for any forms of practice, be that peaceful, vast, strong or angry. Main guru-bead can consist of three beads, symbolizing three the vajra Indra's states of creature, three kaya. The littlest bead above can be siney, possibly from lazurite. A blue color is symbolized by the unchanging mind of absolute truth. A middle bead can be red (activity), that symbolizes vajra Indra's speech, and a secret bead can be white, that symbolizes a vajra Indra's body (innocence). Your mala can be blessed a lama, and you must constantly bless your mala, satiating it energy. You must inlay energy in your mala before to count up mantras, for the receipt of the real benefit. You must clean your mouth and hands, and then your mala, before that use it. You can saturate with its sandal and by other oil. Then engender itself as a deity, taking mala in a left arm and setting guru-bead (brush) apeak in a center. Repeat a mantra which transforms everything dharma in the awareness of their veritable nature: "OHM OF SVABAVA SHUDDO SARVA DKHARMA OF SVABAVA SHUDDO BOOR". This mantra beads and transforms impure perception in the awareness of emptiness. From emptiness, guru-bead shows up as a central deity is in mandale, and other beads show up as his retinue. This part of practice is meditation on samayasattvu. Further, call dzhnyanasattva. Invite the creature of primordial wisdom to come, attracted they dissolve in samayasattva, because it takes a place in sadhana. You will invite the creatures of wisdom to come from the clean countries in space before you. Then they dissolve in your male and remain there. Thus, every part of your malas is complete mandaloy. It includes a central deity, retinue, lotus seat, jewelry, attributes of hand, colors and other. Your blessed mala thus, increases every syllable of mantra which you after repeat in 100000 times, besides it creates a good karma. Therefore it is very important to do just like this. Your mala presents not only the form of deity but also speech of deity also. For example, if you repeat the Stoslogovuyu mantra, guru-bead presents the syllable of "OM", and other beads are presented by other syllables. Padmasambkhava said: "Every time, when you repeat peaceful mantras, use the tag of your pollex, to revolve mala. When repeat vast mantras, use a middle finger. Use a nameless and large finger, when repeat strong mantras, and use mezinec, when repeat angry mantras." Use only your left arm for the count of mantras. A right arm is used very rarely; for example, in some angry practices. Some books teach to use both hands, but not use a right arm only. Whatever type of practice you did, whether peaceful it, angry, strong or vast, always realize that a pollex is a vadzhpnym hook which catches spiritual forces, deities and other benedictions. Also, as easy as anything to move beads exactly by a pollex. Next studies which explain how to take the care of your male when you do not use it came straight from the mouths of Padmasumbhava. If your mala is repeatedly blessed great lamas, your own teacher and by you during practice on a deity, it can accompany you like shade. You save native samayu vadzhpnoy malas never allowing it to unstuck from your body. A lot of different recommendations behaves to the proper care and use of malas, but only not many are mentioned here. Never allow it to cool off from the heat of your body. Never show your secret vajra Indra's mala to other people. Never give your mala in the hands of other people. you get on the hip your mala, only when repeat mantra. Not play and not pull it in vain. Not guess on it and not use as abacuses. Save mala hidden (if can steal it) and have a deferential relation to it. Never put it in low places (if dampness - mislay), and certainly not on earth (if wet earth). Not thread a bead on your mala, if herein there is not sense and not use it as by a jewelry. If you adhere to these words in attitude toward your male, you attain everything, what wish to attain. Studies which were just give, touch malas, which was blessing benediction many times. From other side, if you have usual mala, which was not blessed and does not have a large value for you, you can play with it how many pleasingly.